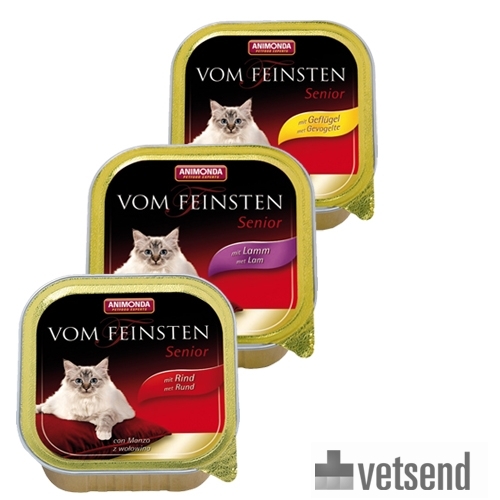 Animonda Vom Feinsten Senior is a complete diet for older cats (> 7 years). This wet food in handy tubs is available in 3 different flavours (beef, poultry and lamb). Older cats, from the age of seven, have different nutritional needs. Senior wet food from Animonda is easy to chew and adapted to meet these nutritional needs. Beef: 63% meat and animal derivatives (24% beef, pork and chicken), stock, minerals. Poultry: 63% meat and animal derivatives (20% poultry, pork and beef), stock, minerals. Lamb: 63% meat and animal derivatives (chicken, beef and 8% lamb), stock, minerals. Have you used Animonda Vom Feinsten Senior before? Let us know what you think about this product.